Coronal fractures of the anterior teeth are a common form of dental trauma that mainly affects children and adolescents., The majority of dental injuries involves the anterior teeth, especially the maxillary incisors because of their exposed position in the dental arch and dental trauma in most cases causes damage to the crown. Traumatic dental injuries are prevalent in clinical practice, and their management is a challenge for the clinician, who, depending on the type of injury, will have to choose among several possibilities to approach the problem. Traumatic injury that involves a permanent tooth can sometimes create a difficult situation for the child, the parents, and the dentist, who may opt for treatment that aims to save the original traumatized tooth. Complicated traumatized anterior teeth require quick functional and esthetic repair. Such traumatized teeth can be saved primarily by an endodontic therapy followed by composite buildup, cast post, prefabricated post, and veneering and full coverage crowns for functional and esthetic purposes. One of the options for managing coronal tooth fractures, especially when there is no or minimal violation of the biological width, is the reattachment of the dental fragment when it is available. This procedure provides a better core than the resin-based composite for full coverage crown that can restore function, results in a positive psychological response, and is reasonably a simple procedure, with good and long-lasting esthetics. Therefore, most concerns about reattachment techniques have been directed toward the fracture strength of the restored tooth.,, However, reattachment procedures serve only as a semi-permanent replacement and the longevity is questionable in comparison with the conventional approaches. In complicated fractures that have been endodontically treated, their pulp chamber provides space that serves as an inner reinforcement, so further preparation of the fractured tooth is not required. Composite materials are commonly used for esthetic restorations in clinical practice; however, these materials have poor mechanical resistance. Different approaches for strengthening composite materials have included reinforcing their resinous matrix with fibers or using glass-fiber posts consisting of glass-interlaced filaments. The translucent glass-fiber post has a modulus of elasticity similar to that of dentine and offers adequate mechanical properties., Another advantage of these fibers is that light can be transmitted through and can be bonded with a light-cured adhesive system or dual-cured resin cement after acid etching. 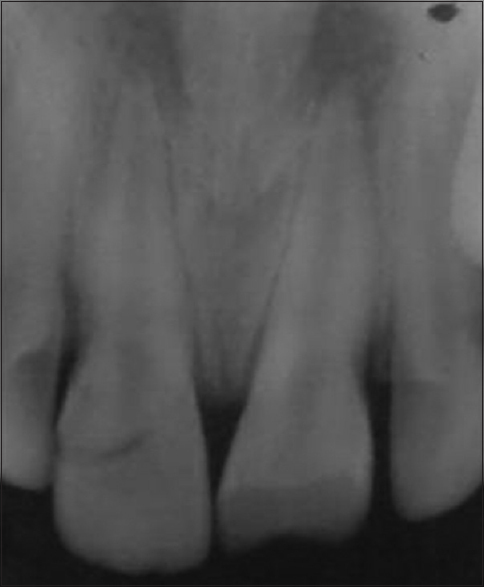 The objective of this paper was to present a case of complicated crown fracture requiring endodontic treatment and the use of glass-reinforced fiber composite aimed at creating a central support stump to restore dental morphology followed by porcelain-fused metal crown to avoid the difficulties, including possible failure. 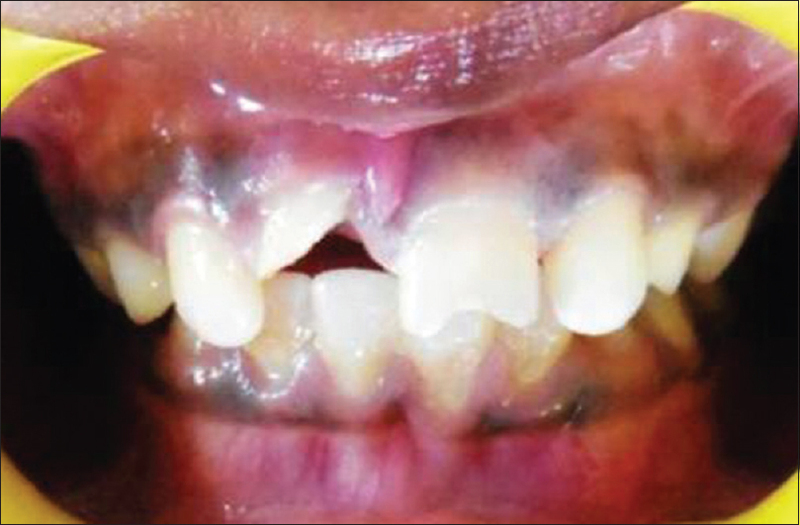 A 10-year-old male child accompanied by his mother reported to the Department of Pedodontics and Preventive Dentistry with a chief complaint of broken anterior teeth since 2 days. Detailed history revealed that the patient had fallen from stairs while playing during school hours and was associated with pain and swelling in the maxillary anterior region. Pain was dull and continuous in nature that subsided on taking medication whereas swelling was diffuse and limited to the upper left region of the lip. On extraoral examination, soft tissue laceration was present on the upper and lower parts of the lip whereas intraoral examination revealed mixed dentition, presence of laceration on labial mucosa, complicated crown fracture (Ellis Class III) with 11, Ellis Class II with 21, and Class I caries in relation to 75 and 85. The fractured segment of crown with 11 was loosely attached to the palatal gingiva. There was Class I caries in relation to 75 and 85, and intraoral peri-apical radiograph showed the widening of periodontal ligament with respect to 11 and 21. Both clinical and radiographic examination confirmed the Ellis Class III and Ellis Class II fracture with 11 and 21, respectively [Figure 1] and [Figure 2]. Figure 1: Preoperative front view. Figure 2: Preoperative intraoral peri-apical radiograph. The treatment was planned in six phases. (1) Emergency phase included the surgical removal of fractured segment with 11 followed by access opening with 11 and 21. (2) In medical/systemic phase: capsule amoxicillin (250 mg) + clavulanic acid (125 mg) 8 hourly for 5 days, tablet metronidazole (200 mg) 8 hourly for 5 days, and tablet ibuprofen (200 mg) 8 hourly for 3 days. (3) Preventive phase: oral prophylaxis and oral hygiene with diet instructions. (4) Preparatory phase: root canal therapy with 11 and 21 and sandwich restoration with 75 and 85. (5) Corrective phase: reattachment of fractured segment with glass-fiber-reinforced composite post with 11 and composite buildup with 21 followed by porcelain-fused metal crown with 11 and 21. (6) Maintenance phase: recall after 1 week for follow-up and then recall for regular checkup after every 3 months. The parents were given detailed information about the entire procedure and consent was obtained. 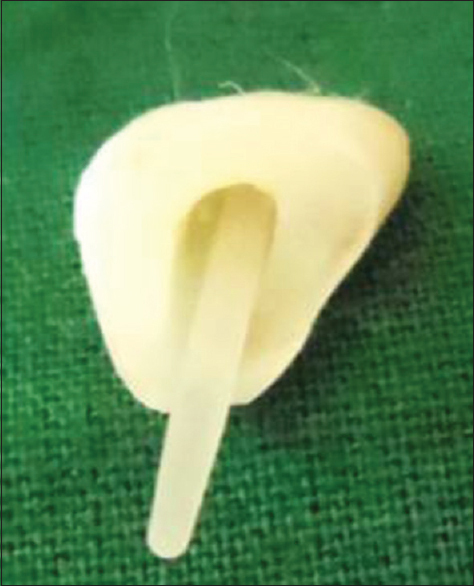 Under aseptic conditions, local anesthesia was administered in the maxillary central incisor region, and the fractured segment of 11 was surgically removed [Figure 3] and stored in 10% formalin till the completion of endodontic procedure. Access opening was carried out with respect to 11 and 21, pulp was extirpated, and the canal was thoroughly instrumented. On subsequent visit, the obturation with 21 and sectional obturation with 11 were completed followed by composite buildup with 21 [Figure 4] and sandwich restoration with 75 and 85. On visual examination, it was observed that there was gingival overgrowth on the palatal aspect of 11, and a comprehensive decision was made to surgically excise the overgrowth so as to approximate the fractured tooth segment. Thus, gingivectomy was carried out with electrocautery [Figure 5], and the fractured segment was approximated. The glass-fiber-reinforced composite (Tenax Fiber Trans, Coltene Whaledent Pvt. Ltd., USA) was selected and the fractured segment was prepared for the adaptation of the fiber post. The fiber post was trimmed to adequate length and the approximation of the fractured attachment [Figure 6] and [Figure 7] was carried out followed by etching with 37% phosphoric acid (3M ESPE, Scotchbond ™ Multipurpose Etchant, USA) to the pulpal wall of the root and fractured crown. It was then bonded with dual-cure resin (3M ESPE, Rely X ™ U200, Germany) under visible light [Figure 8]. The occlusal clearance was evaluated, and the patient was recalled after 10 days for further treatment. The teeth were asymptomatic in subsequent appointment. The parents were given the options of acrylic crown and polycarbonate crowns but were not convinced by its esthetics. Then, they were given the option of porcelain-fused metal crown and were also informed about the need for change of it at a later age but they were still willing for the same. 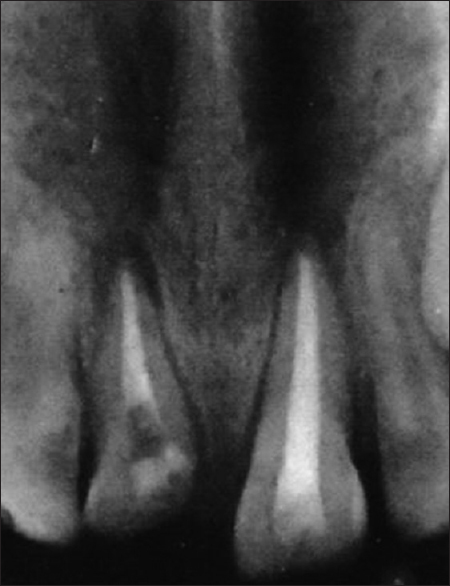 Hence, the teeth 11 and 21 were prepared and cemented after 2 days using glass ionomer-luting cement (3M ESPE, Ketac ™ Cem Radiopaque, Germany) [Figure 9],[Figure 10],[Figure 11]. The patient was recalled after 2 weeks for routine checkup, and further postoperative radiograph after 2 years showed no pathology with the treated teeth. Figure 3: After removal of broken tooth segment. Figure 4: Obturation with 11 and 21. 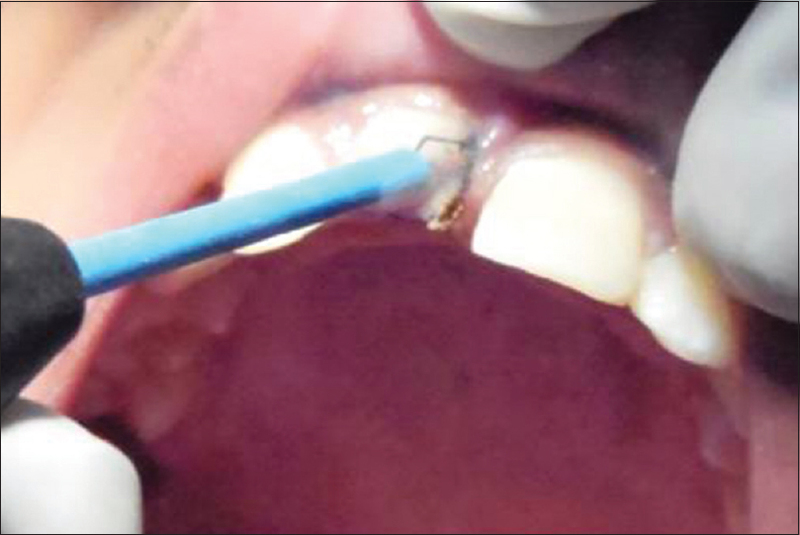 Figure 5: Gingivectomy with electrocautery. Figure 6: Adaptation of fiber post. Figure 7: Broken segment preparation for fiber post. Figure 8: After attachment of broken segment with 11 and composite buildup with 21. 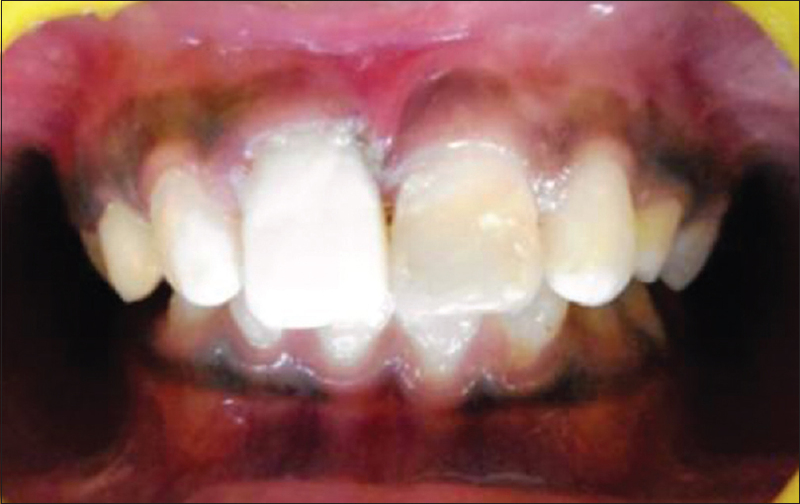 Figure 9: After porcelain-.fused metal crown. Figure 11: Patient's smile postoperatively. Trauma with accompanying fracture of anterior teeth is a tragic experience for young patients and requires immediate attention, not only because of damage to the dentition but also psychological effect of the trauma to the child and his/her parents. It has been found that there is a positive emotional and social response from patients to the preservation of natural tooth structure. 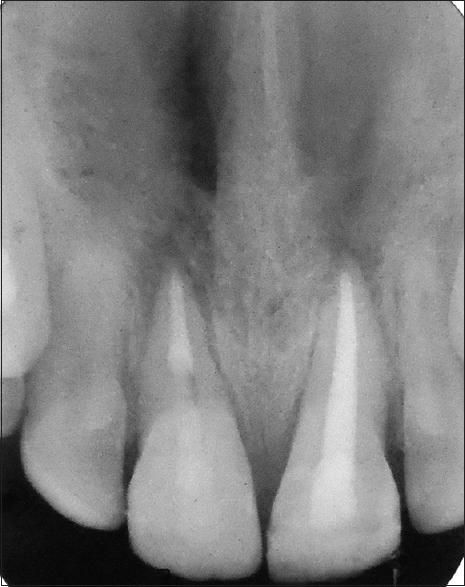 In cases of pulpal involvement, a root post is mainly followed after endodontic treatment to provide mechanical support for the fractured segment. For better esthetics, tooth-colored glass-fiber composite posts can be utilized as they have light transmission properties and are capable of resisting occlusal loads., Transmission of light through the post simplifies and shortens the clinical procedure. In the present case, an adhesive, dual-cure-luting composite system and a glass-fiber-reinforced composite post were used. When compared with alternative techniques, reattachment using a fiber post has much more advantages such as minimal patient cooperation with little clinical time and ready acceptance by the patient. To minimize more clinical time, sectional obturation was done with 11 so that the fiber post adapts readily, and for better esthetics and longevity of a nonvital fractured tooth, porcelain-fused metal crown was utilized as a permanent restoration. Functional, esthetic, and biologic restoration of the fractured incisor is an intimidating challenge for a clinician. Conventional composite resin restoration may result in less than ideal contours, color match, and incisal translucency. The tooth buildup with composite resins tends to take up stains from food and beverages that a patient consumes over a period of time and thus the esthetics is compromised. All restorative techniques, however, present limitations, and reattachment is not an exception. The first limitation is that the longevity of this procedure is not predictable, and the fragment may detach from the remaining tooth tissue. The attachment of the fragment in an adequate position may be difficult depending on the characteristics of the fracture and fragment. In cases of nonvital tooth, esthetics may become an important issue as pulpless teeth lose part of their translucency and brightness over time. In addition, dehydrated fragments may not retain the original hue and translucency, resulting in a poor esthetics. The bonding line between the remaining tooth and the fragment may also present a demarcating line with a different shade. Long-term prognosis of the fractured segment may be queried and may thus require other restorative alternatives such as veneering and crown fabrication in case of failure. Hence, to overcome such problem, porcelain-fused metal crown was selected as a permanent restoration. 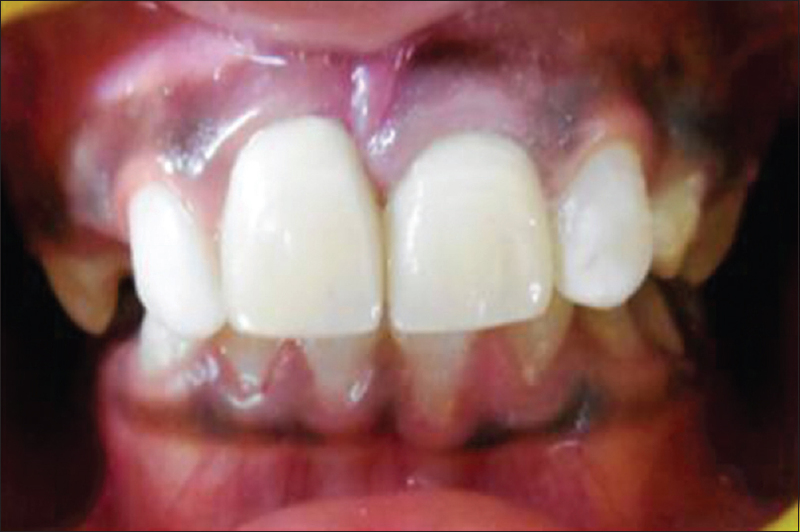 There are citations in the literature regarding the use of porcelain-fused metal crown in children.,, Combined techniques as in this case report can be used in the management of complicated anterior tooth fracture that has shown better prognosis, functions, esthetics, and satisfaction of patient and parent. 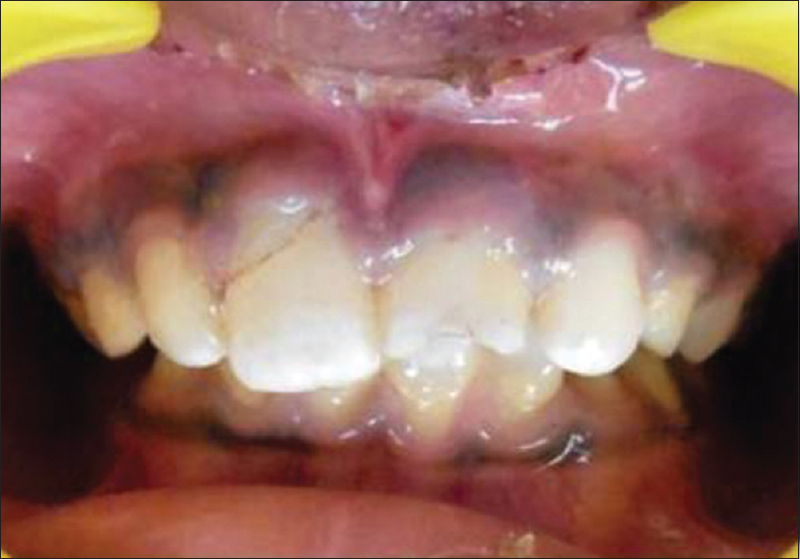 This case report describes comprehensive and multidisciplinary management of a complicated crown fracture, leading to conservation of the original tooth segment followed by permanent restoration. Macedo GV, Diaz PI, De O Fernandes CA, Ritter AV. 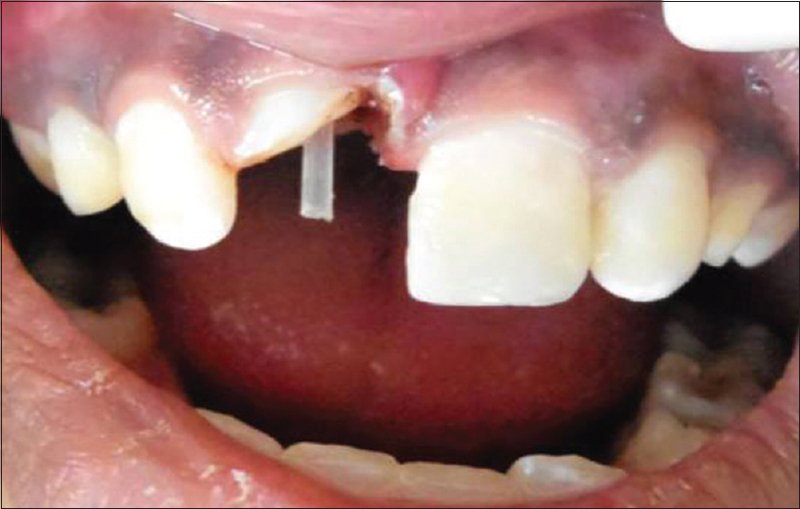 Reattachment of anterior teeth fragments: A conservative approach. J Esthet Restor Dent 2008;20:5-18. Jardim Pdos S, Negri MR, Masotti AS. Rehabilitation to crown-root fracture by fragment reattachment with resin-modified glass ionomer cement and composite resin restoration. Dent Traumatol 2010;26:186-90. Baratieri LN, Ritter AV, Monteiro Júnior S, de Mello Filho JC. Tooth fragment reattachment: An alternative for restoration of fractured anterior teeth. Pract Periodontics Aesthet Dent 1998;10:115-25. Samadzadeh A, Kugel G, Hurley E, Aboushala A. Fracture strengths of provisional restorations reinforced with plasma-treated woven polyethylene fiber. J Prosthet Dent 1997;78:447-50. Vichi A, Grandini S, Davidson CL, Ferrari M. An SEM evaluation of several adhesive systems used for bonding fiber posts under clinical conditions. Dent Mater 2002;18:495-502. Dietschi D, Romelli M, Goretti A. Adaptation of adhesive posts and cores to dentin after fatigue testing. Int J Prosthodont 1997;10:498-507. Hegde RJ. Tooth fragment reattachment – An esthetic alternative: Report of a case. J Indian Soc Pedod Prev Dent 2003;21:117-9. Freedman GA. Esthetic post-and-core treatment. Dent Clin North Am 2001;45:103-16. Jain V, Gupta R, Duggal R, Parkash H. Restoration of traumatized anterior teeth by interdisciplinary approach: Report of three cases. J Indian Soc Pedod Prev Dent 2005;23:193-7. Verma L. Managing the challenge of sports related dental injuries in atheletic children-A case report. J Exerc Sci Physiol 2011;7:64-7. Navit S, Goel I, Sharma A, Mayall S. Management of trauma in maxillofacial complex in 13 year old child. TMU J 2014;1:30-32.